A local restaurateur has capitalized on a foreclosure auction to expand his local holdings into the Fan. Antar Abouzaki, who owns Shawarma Shack on West Grace Street, purchased the Pie restaurant property at 214 N. Lombardy St. at an on-site auction on Tuesday. Abouzaki’s winning bid of $566,000 landed him the two-story 5,000-square-foot building that includes Pie’s space, as well as two apartment units. The property had been owned by JTB Fan LLC, an entity tied to Pie owner Mo Roman. The foreclosure was carried out by Fulton Bank and was prompted by JTB Fan defaulting on a loan issued in 2007. It’s unclear whether Pie is still in business. It was open sporadically during its normal business hours in recent weeks, but posts on its Facebook page suggest it was open as recently as Halloween. Roman could not be reached for comment, and Pie’s equipment and furniture were not part of the sale of the property. Abouzaki owns Shawarma Shack and the neighboring hookah bar called Cloud at 933 W. Grace St. He said he plans to use the Pie property as an investment. He said he does not have a restaurant tenant lined up and is willing to consider leasing the space to Pie. 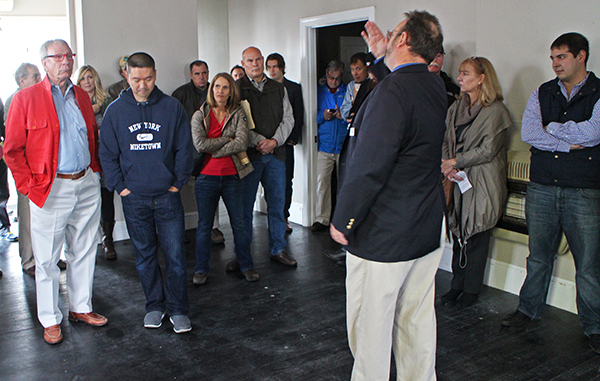 Abouzaki was joined at the auction by more than 30 curious restaurant owners, developers and neighbors. There were about 11 registered bidders in the audience. The Pie property was threatened with foreclosure at least once before. Roman put JTB Fan into bankruptcy last year to block the lender’s initial attempt. The sale also marks the second time this year a Richmond property tied to Roman has sold at auction. In June, an old bank building turned restaurant and bar at 1005 E. Main St. was sold at a bankruptcy auction. That property had been owned by another LLC tied to Roman. Earlier this month, a Rocketts Landing restaurant called Mbargo, which was co-owned by Roman’s wife Amy and attorney Steve Goodwin, closed, according to the Richmond Times-Dispatch. Local broker Raffi Bandazian represented Abouzaki at Tuesday’s auction, which was conducted by Tranzon. A 10 percent buyer’s premium will be added to the contract price. The property was most recently assessed at $673,000, according to city records.